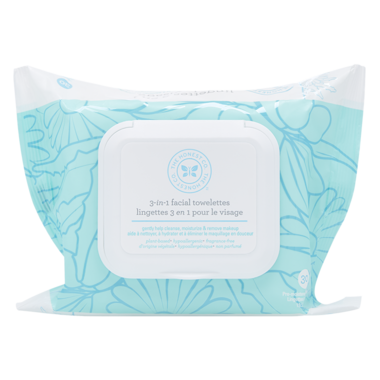 The Honest Company 3-in-1 Facial Wipes gently cleanse, moisturize and remove makeup with these ultra soft, medical-grade, sustainably harvested plant-based cloths. These ultra-soft wipes effectively remove dirt, oil, and all traces of makeup. Enriched naturally-derived olive oil and plant botaniclas to help effectively dissolve and remove makeup and hydrate skin without rinsing. Infused with aloe and chamomile to cleanse and condition, leaving skin purified, fresh and healthy-looking without a greasy residue. Extra gentle for delicate eyes and sensitive skin. Directions: Gently wipe eyes, face, and neck to cleanse the day away! Rinse if you like, or leave on for ultra hydrated and happy skin. Juice Powder, Glycerin, Silver Citrate, Citric Acid, Tocopherol, Maltodextrin. develops, stop use, and contact your physician. I had high hopes for these wipes but they felt rough and stung my face. These are the only wipes I've found that are sensitive enough for my skin and also remove all my makeup! There is also little to no smell. Love these! My favourite wipes ever. I can take all my makeup off with one wipe it takes my mascara off and does not irritate my eyes. Very happy with them. These wipes are very moisturizing and not drying like most facial wipes. I use these to remove makeup before washing my face. Works well. I use these wipes to take off my makeup before I wash my face. Works like a charm and love that they're 100% natural. I really like the Honest line of products. I just used this product for the last week and I love that it doesn't have a scent to breathe in that close to your face. It takes off all my makeup and leaves my face filling great. I really like it. It really cleans my face well. I am glad it allows to take off eye makeup as well. I really love these wipes! I have been using them for a couple months now and they are a staple to my routine. Before I wash my face I use these wipes to remove my eye and face makeup. They are non-irritating and very moisturizing and do a great job at removing makeup. I would recommend giving these a try! These wipes work well when in a pinch and can't use traditional face wash. I keep some at work and in my purse to freshen up during the day. Mild scent. Completely satisfied with this product. Gentle enough to use every day. I have sensitive, thin skin and am going through hormonal changes. I use these wipes twice per day and a facial scrub once per week. Looking good, feeling good! I didn't really like these face wipes. They don't really remove make up very well. I'm a big fan of Honest Company, just not this particular product. I like this product, but I won't be buying it again. It leave a greasy, film-like feeling on my skin. Gentle on my sensitive skin, but barely removes makeup. After using a wipe, I had to use oil to remove my makeup and then cleanse as normal after. Shouldn't have to use three products for a so-called three-in-one to work. Useless for cutting down products while travelling. I use these for light makeup. Haven't tried them with waterproof. I like them, they are gentle and great to take on trips. Would not buy this product again ..I don 't like the smell ... Essential oils would go a long way to enhance this product naturally ! Love that this was cruelty free and it did its job. The reason why it lost 1 star is because when i try to remove my eye makeup or makeup around the eyes it really stings my eyes..other then that it's a good wipe. Easily removes makeup, fine for sensitive skin, left feeling clean, not sticky or scented. I have tried a ton of facial wipes. I do not like these. They do not remove makeup, especially mascara very well. They make my eyelashes stick together and it feels like there is a residue left on my skin. gets make up off great , leaves face feeling moisturized , used to take off daughters halloween make up too and worked great. buy them often. Loved these wipes. Remove all makeup and leaves your skin moisturized. I love love love these!!! I love how they feel and they do a heck of a job cleaning my face! Even my eyes have zero issues and the skin feels refreshed and clean afterwards!!! It dosnt leave my skin anything but soft!! No sticky film or anything just clean!! Packed in my hospital bag for my last delivery and felt the ingredients left a heavy oily feeling on my face along with a breakout or reaction of some sort causing itchiness.